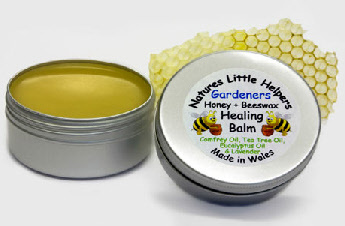 This fantastic balm helps the gardeners hard working hands with honey and oils of Sweet Almond, Coconut, Jojoba and Wheatgerm to moisturise, while the extra beeswax we add provides a barrier. There is also Comfrey, Eucalyptus and Tea Tree oil to help with all the damage the gardeners hands have to cope with. Sweet Almond Oil, Beeswax, Coconut Oil, Wheatgerm Oil, Honey, Comfrey Oil, Vitamin E, Eucalyptus Essential Oil, Tea Tree Essential Oil and Lavender Essential Oil .